Nutan Varsh or Bestu Varsh is the New Year’s Day in Gujarat. The first day in Gujarati Calendar is the day after Diwali – Kartik sud 1. This calendar is also known as Hindu Vikram Calendar and the year is known as Vikram Year. Hindu Vikram Year 2076 begins on October 28, 2019. The huge amount of food offerings on the day made to deities, especially to Sri Krishna, used to take the form of a mountain. Thus the day also got the name – Annakut – 'Anna' meaning food and 'kut', mountain. It is said that Veda Vyas once revealed to Yudhishtira, the eldest of the Pandava brothers, that one who remains peaceful and happy on Kartik sud 1 will experience the same throughout the year. The day is also observed as Bali Padyami and Govardhan Puja. 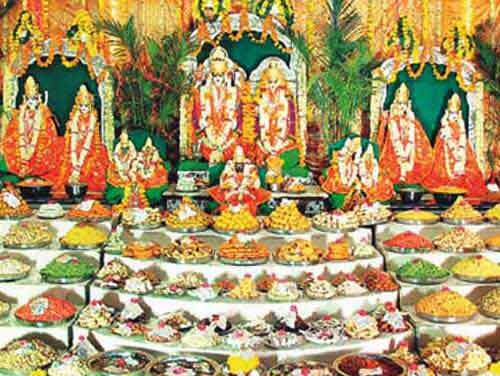 Offering sumptuous food to the favorite deity is the most important ritual on the day. People also wish each other for a peaceful and happy year. It must be noted here that the calendar followed in North India begins in with Chaitra month (March – April). In that calendar also the current year is Vikram Year 2074.